A perennial in the tropics, it can be overwintered in colder areas if the tuberous roots are brought inside. The vines grow 8 to 12 feet (2 1/2 to 3 1/2 metres) long, with dark-green, heart-shaped leaves. Each vine will produce about 20 flowers, which are edible and can be used as a garnish in salads (though you won’t of course get any beans from it afterward.) The flowers and leaves are attractive, allowing the plant to do double-duty as an ornamental and a food plant. The pods that the plant produces are green, and when young, they are curved, but straighten out as they grow. When Scarlet Runner Beans are very young, they can be eaten as a green bean, but past this stage, the pod gets coarse and stringy. Later on, they can be used as a shelling bean, if they are harvested just as the pods start to dry and turn yellow, or they can be let to fully mature and used as a dried bean. The glossy beans inside the pods tend to be almost all black or dark purple with black splotches. Scarlet Runner Beans are very popular in England as a green bean. People even buy bean slicers especially made for them, to slice them up in small, thin slices. For a green bean, pick Scarlet Runner Beans when they are no more than 6 inches (15 cm) long, top and tail, string, then slice them into pieces anywhere from 1/4 inch to 2 inches (1/2 cm to 5 cm) — preferences vary. A variety called “Scarlet Emperor” has particularly good eating beans. The plant will keep on producing high yields of beans throughout the season. Dried beans double in size when cooked. 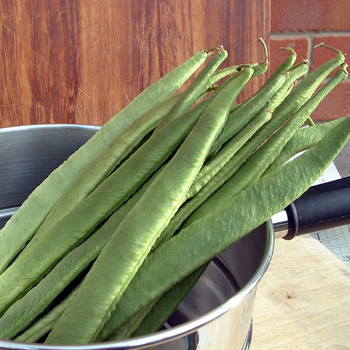 Boil green beans for about 5 minutes, until just tender. Scarlet Runner Beans are presumed to have originated in Mexico or Guatemala. In England, Scarlet Runner Beans were grown as an ornamental plant until the mid-1700s, when they started being grown as a vegetable plant as well. Charles Darwin did experiments with Scarlet Runner Beans. In America, Scarlet Runner Beans are occasionally called the “Oregon Lima Bean”.